The Java Junction management class, taught by Michelle Horning, a business professor, runs the coffee shop located in the Kratz, Miller and Yoder connector. Java Junction is an epicenter for student life—a space constantly filled with meetings, student homework, and the smell of freshly brewed espresso. Although Java is well used, most students are unaware that their fellow students run the entire business. The class meets three times a week, just like any other class, but these class times are used as management meetings and chances to resolve any issues. Essentially, these students are responsible for managing all conflicts that come up as well as making sure Java runs smoothly and efficiently. 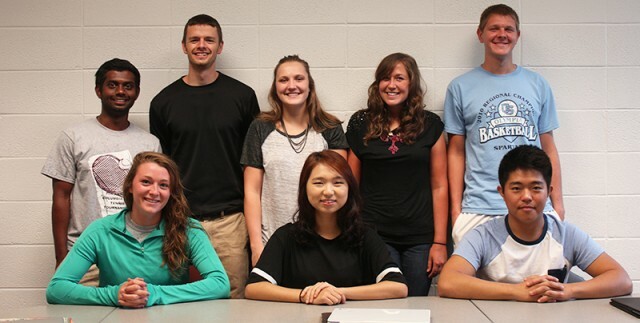 Students in the class for the fall semester include: Megan Strock, a senior; Liz Tecca, a junior; Jieun Han, a senior; Minah Kim, a senior; Neal Brubaker, a senior; Dean Nafziger, a junior; Malaina Weldy, a junior; Zach Thompson, a senior; and Vasanth Palanasimy, a senior. “The way it’s structured is students who are on the management team—so the management team is not necessarily who you see behind the counter—get credit and get graded like every other class,” Horning said. Horning calls herself the “responsible adult.” She is only a reference point for her students; they are in charge of managing the entire business. Horning does not help with any of the marketing decisions or business tactics besides giving the students three projects a semester, each of which pertains to a different aspect of the coffee shop. “We purchase our own food, we pick it up, we put it in the case. We do our own accounting, and every Friday, we put that out to Michelle,” said Megan Strock, the general manager for Java. The class is divided into six different positions: purchasing, marketing, operations, accounting, catering, and general managing. The Java Junction management class truly gives a student insight into what managing a business is like. Students are allowed to take the class for a full school year. “One of the unique aspects of the class is the unpredictability of it, because you never know what’s going to happen from day to day in terms of equipment breaking down, or employees not coming to work on time or whatever it might be,” Horning said. This year marks the 11th year Java has been open. To support your peers and the Java Management class (the final grade is based on the management team’s financial success for the semester), go buy coffee or a bagel at Java. Java is open from 7:30 a.m.- 4:30 p.m. Monday through Friday; 1:30 p.m.-4:30 p.m. Saturday and Sunday; and 7:30 p.m.-11:30 p.m. every night.